이 경전은 당(唐) 현장법사(玄奘法師)가 번역한『반야바라밀다심경』이 전체 4면의 절첩장 형식으로 되어 있다. 상하간 19.7cm, 무계(無界), 1면은 6행 16자, 2~4면은 5행 16자이며, 표지 제첨은 10.5×3.3cm의 크기에 ‘반야바라밀다심경(般若波羅蜜多心經)’이라고 먹으로 쓰여 있다. 때에도 이 지문은 중요한 자료가 된다. 이 경전은 동진(東晋)의 불타발다라(佛駄跋陀羅)가 번역한『대방광불화엄경』진본 60권 중 권16~20의 잔본 1책이며 호접장본(蝴蝶裝本)이다. 상하단변(上下單邊), 좌우쌍변(左右雙邊)에 반곽(半郭) 24.5×15.8cm, 무계(無界)이며, 반엽이 17행 34자로 된 소자본(小字本) 화엄경이다. 판심에는 ‘진십육(晋十六)’, 권차(卷次), 장차(張次) 순으로 되어 있으며, 표지가 없고 상태는 대체로 양호하다. 거란본(契丹本) 계통의 번각본으로서 함차(函次)의 표기가 없는 점에서 사찰본으로 추정되는 귀중본이다. 1. 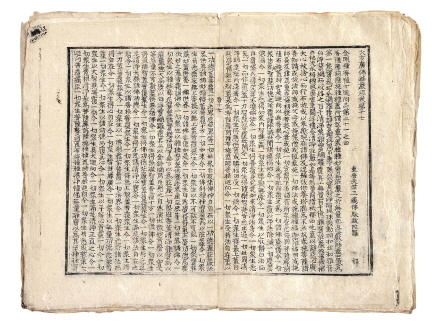 Prajnaparamita hridaya Sutra (The Heart Sutra) This Buddhist scripture, translated into Chinese by an eminent Tang monk named Xuanzang in the 7th century, features a concertina binding of four pages. 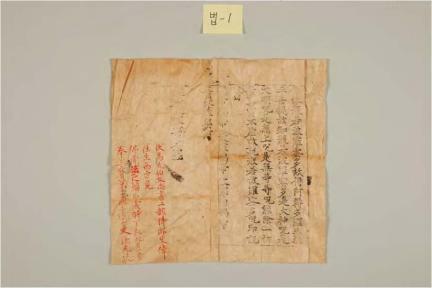 At the end of the main text there is a postscript in red ink revealing that, “This scripture was printed as a prayer that my late eldest uncle Sawi may be reborn in the Blissful Land of the West and hear the law of the Buddha.” It also states that the postscript was “written in the ninth month of the Jeonghae Year by Sa Gyeom-gwang, a Buddhist follower and worshipper of the Three Jewels and a scholar in the Directorate of Education.” Historians believe that the Sawi mentioned in the postscript is the same Sawi who wrote the epitaph of Mun Gong-yu (?-1159). If the Jeonghae Year is assumed to be 1167, this scripture must in fact have been printed in the 12th century. The postscript is regarded as a very important clue regarding the production dates of other hidden treasures. 2. Avatamsaka Sutra (The Flower Garland Sutra), Jin Version, Volumes 16 to 20 These volumes, which are all that remain of the sixty-volume Jin Version of the Avatamsaka Sutra (The Flower Garland Sutra) translated by Buddhabhadra (359-429), feature butterfly binding with single lines on the upper and lower edges and double lines on both sides of each page.